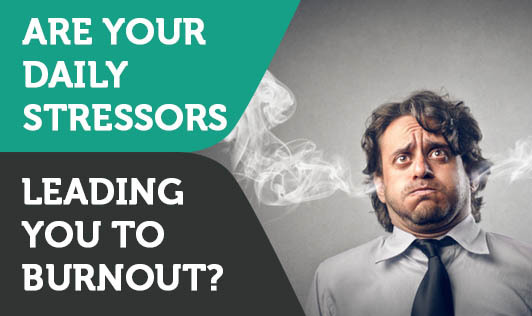 Are your daily stressors leading you to burnout? A lot of people seem to thrive under pressure without realizing that over time, unceasing stress without any down-time will invariably overwhelm us, leading to a lack of enthusiasm for life and ultimately to burnout. We need to first identify the high risk stressors in our lives. Too much of work with little time for anything else: You have all heard of the old adage “all work and no play makes Jack a dull boy.” This holds true more than ever today. The 80-hour weeks that a person tends to put in at work with little or no relaxation is the classic high risk scenario for the advent of burnout. The long work hours result in the feeling of being completely drained, leading to all other activities that sustain us emotionally, like relationships, personal time, and hobbies being put on hold.This imbalanced lifestyle will more often than not lead to high stress and eventually burnout. Lack of a backup system at work: Taking on a lot of responsibilities that can’t be delegated, or an unwillingness on your part to delegate, can also put you on the fast track to burnout. Having the feeling that, ‘Things just won't go right without me", by and large causes an elevated sense of stress. Remember, we all need support, backup, and others we can pass on responsibilities to as and when needed. Little or no social support: Life is not all about handling everything by oneself. We are social beings and we need, we need emotional support to help us deal with the emotional hurdles that we all face in our lives. We all need someone to talk to about our feelings and our stressors, someone to relax with when we have free time. The feeling of being isolated with anxiety creates more stress, and increases our risk for burnout. No time off: It is extremely important that you have an outlet to enjoy life outside of work. This helps you to feel alive and provides you with a break from all the stressors in your life. Ignoring this and focusing just on work and responsibilities makes it harder to sustain yourself through stressful times. Take a vacation with your loved ones regularly, spend time with them. Go, have some fun!